Marketing Technology Fair (MTF) launched its first edition in 2013 in Tokyo. 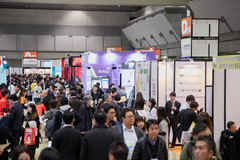 It continues to grow in size and became one of the largest marketing events in Japan.The show also provides all visitors and exhibitors with variety of seminar programs. It is the perfect place to showcase the latest technologies and services to the market professionals. Do not miss great opportunity to be a part of Marketing Anchor Events in Japan!